1) Because he has more body mass on one side of his body, achieving balance and stability is more of a challenge. 2) Because we rely on our legs as ‘levers’ to help with body rotation – a left-leg downbeat helps us rotate (or weight shift) onto our right side AND helps us spear the right arm forward – something must compensate for the missing leverage when he enters his right hand. I watched Paul swim for 10 seconds and could immediately see that he faces the same challenge as every adult who is just beginning to swim — the instinct that Job One is to fight your way from one end of the pool to the other, usually with a flurry of arm-and-leg churning. 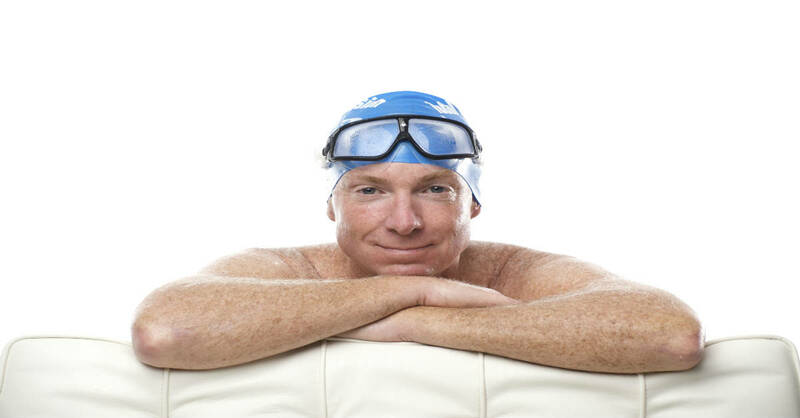 Once he set his sights on doing a triathlon, Paul did what came naturally — took out a pool membership and began trying to build his swimming endurance. What that has meant is churning through a single lap. Pant for a while at the other end, then churn his way back. In the Endless Pool’s current there was no ‘other end’ to reach, but the churning habit still held. Those early laps haven’t only begun forming movement habits. They’ve also begun forming thinking habits. As I explained to Paul, the first thing we need to do is undo his thinking habits. Thinking Differently will make it much easier for him to Swim Differently. As it happens, an Endless Pool is an ideal place to acquire new ways of thinking. There’s no lap to complete, no time to keep, and no distractions at all. There’s only you, the water and the experience they have together. The second clue to awareness I gave Paul was this: Adults who take up swimming not only tend to fight their way from one end to the other. They also tend to engage in near-constant self-criticism and self-judging. They’re aware there’s a Right Way to swim. They’re also aware that what they’re doing is emphatically Wrong. So at every instant they’re likely to be comparing what they ARE doing to what they believe they SHOULD BE doing and finding themselves wanting. But learning to swim (as well as learning nearly anything else in adulthood) doesn’t do well in a Pass/Fail environment. Rather, we should view every experience we have as Information. In this instance our experiences are teaching us how a human body (and psyche) tend to behave in an aquatic environment. Are my arms extended directly forward of the shoulders? Is my head hanging neutral – so I look directly into my own eyes in the mirror? When in this position, how supported do I feel? Is that a new sensation? What significance does this have for my swimming. Ninety minutes later Paul left with a different way of moving and thinking. He’ll practice both in the coming week, before his next appointment with Alice. Learn Balance, Superman Glide and Reflective Thinking in Lesson One of the DVD TI Self Coached Workshop in 10 Lessons. I really enjoyed the first lesson, it helped with different issues. The physics descriptions, were very easy for me to comprehend. I’m looking forward to more lessons !! Terry I appreciate your comments and they helped me focus on the stroke instead of getting to “the other end”. My question is when to move onto the next lesson? Do I perfect each drill. This takes months years as I feel I have not perfected lessons 3 and 4. Should I just go for good enough and move on to next lessons? I know it may sound like a ridiculous question. You are the master I am a struggling self coached adult onset swimmer. Live dangerously! Move on. Discover your errors and weak points and improve on them. Finding and fixing errors is the Master’s path. I find that I skate better on my left side than my right. I have compared head, arm and upper torso positions and they appear and feel the same. Yet, I am not riding as high in the water and have little or no propulsion which leads to my legs sinking. I have worked on this quite a bit but can not figure out the differnce. Any suggestions?